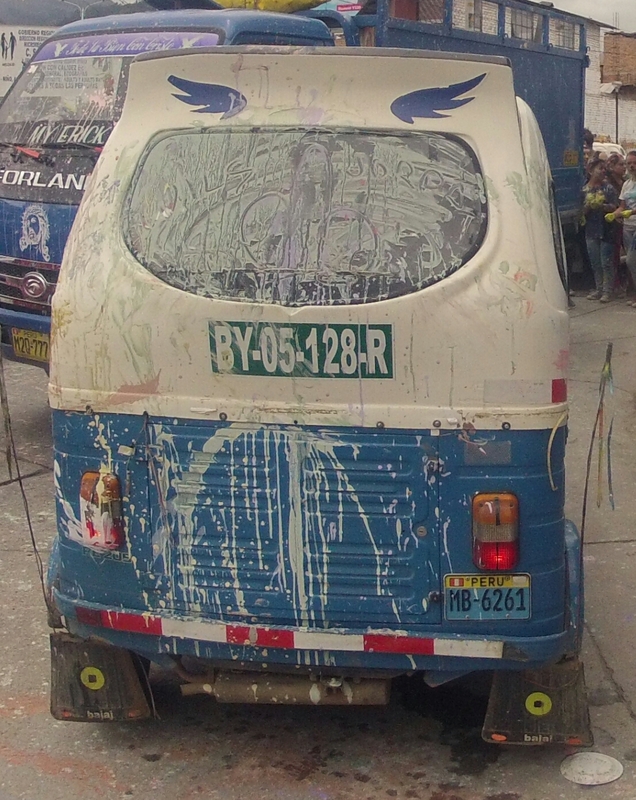 Posted on February 23, 2015 by No Map Required Posted in Peru, Places	. The police or military or para-military…whatever they were, stood in a row staring straight ahead, doing their best to contain the crowd and get folks to keep moving ahead. Their serious looking uniforms, complete with army boots, long sleeves, badges and hair cut short under their caps were all black…aside from the multi-colored rainbow of speckled paint making them look juuuust a bit less imposing. It was like being herded by professional painters on their way to work. 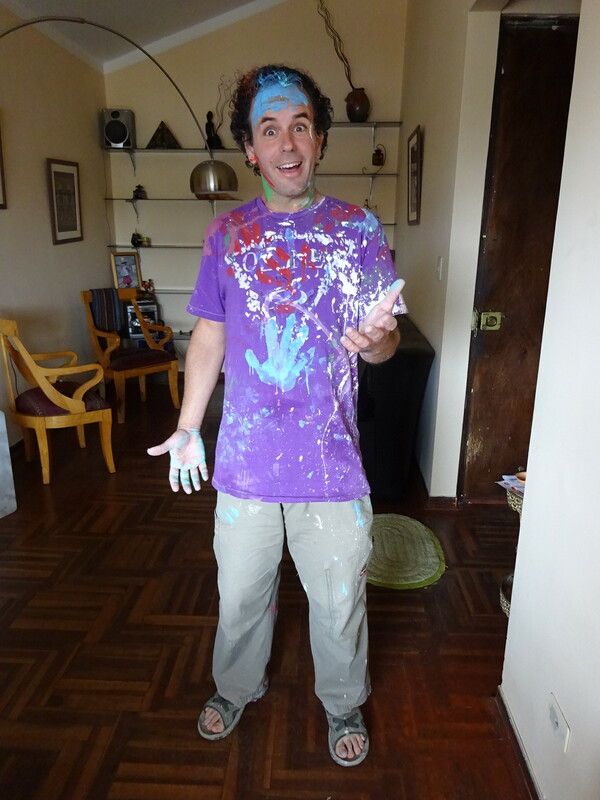 This here is the official (paint filled) start of Carnaval…South America’s answer to Mardi Gras. We’ve begun 4ish days of revelry and partying here in Peru! Crazy times! Paint is literally flowing in the streets. 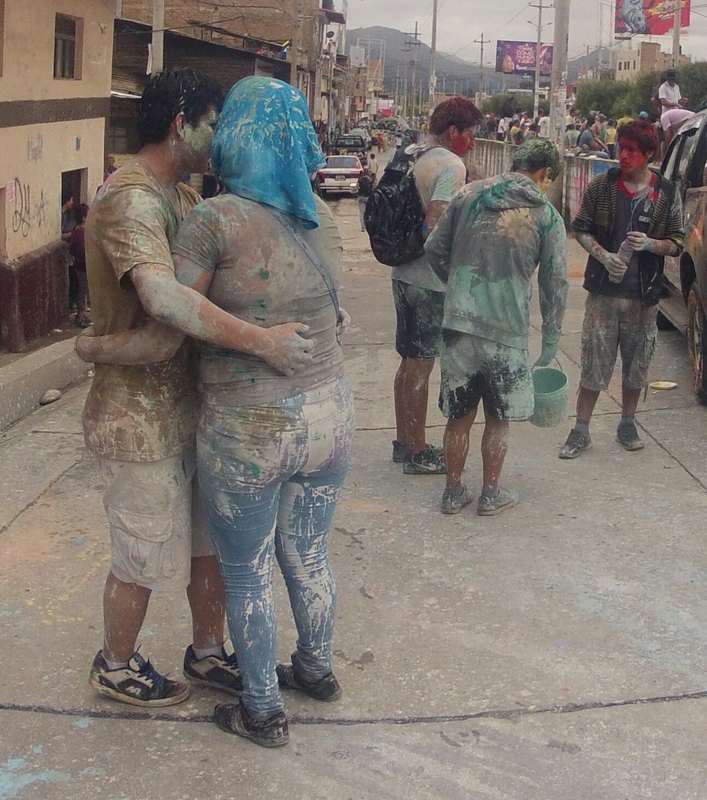 Aaron and I both had our apprehensions this morning about joining big crowds of paint-throwing teens, but all the travel guides say: “take part in local festivals” and we’re nothing if not rule followers. Our host mom gave us her son’s clothes to wear, knowing our gear would get totally trashed. The only sentence I’ve heard her speak in English was when she brought out some clothes for us to try on and said, “My son, how do you say, he is fat.” Well, fat is just my size and as luck would have it, Aaron and I both found something we could wear (which is impressive because most Peruvians are tiny people that we both tower over). I digress. So, despite our nervousness about it all, we got up this morning, put on Gordito’s hand-me-downs, grabbed our GoPro (in it’s waterproof case we figured it could handle the paint) and headed to the streets. It was a little slice of madness with people armed with water balloons, super soakers (a la Denali Park Water War 1997) and buckets (BUCKETS!!) full of paint. We stood there for the longest time just taking it in. Our best guess is that it’s 65% male, and most people are between 15 and 25. They mosey around with their friends playing a particular tune on a sax or trumpet or recorder accompanied by whatever percussion is available – lots of drums. Lots! There was dancing and singing and squealing. It was festive and good-natured – a paint filled, unorganized Honkfest, for those who know the Seattle alt-music festival. Turns out, it’s nothing to be scared of! Love this shot! 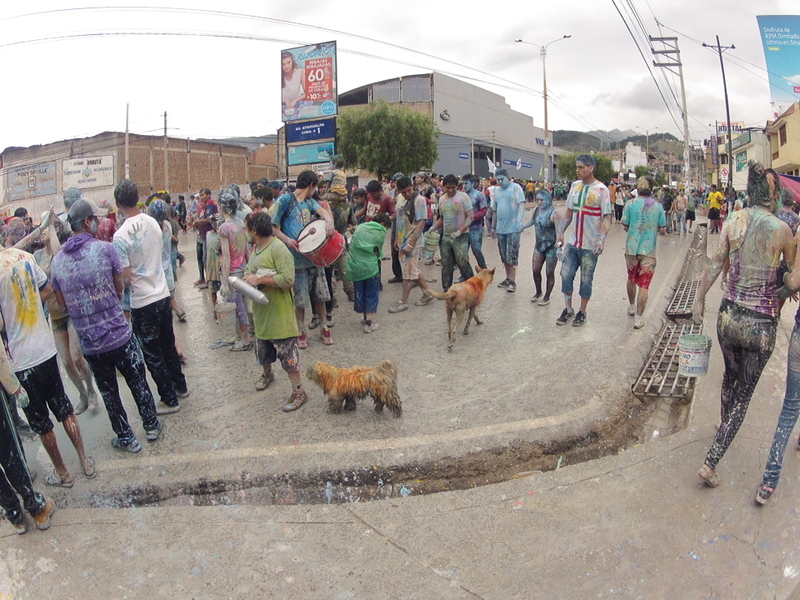 A guy with a drum, a girl with a bucket of paint next to him and throngs of people awaiting the next attack. Cars are totally fair game at Carnaval. This guy only rolled down his window when he saw us taking the photo, otherwise your windows better stay up if you know what’s good for your interior! 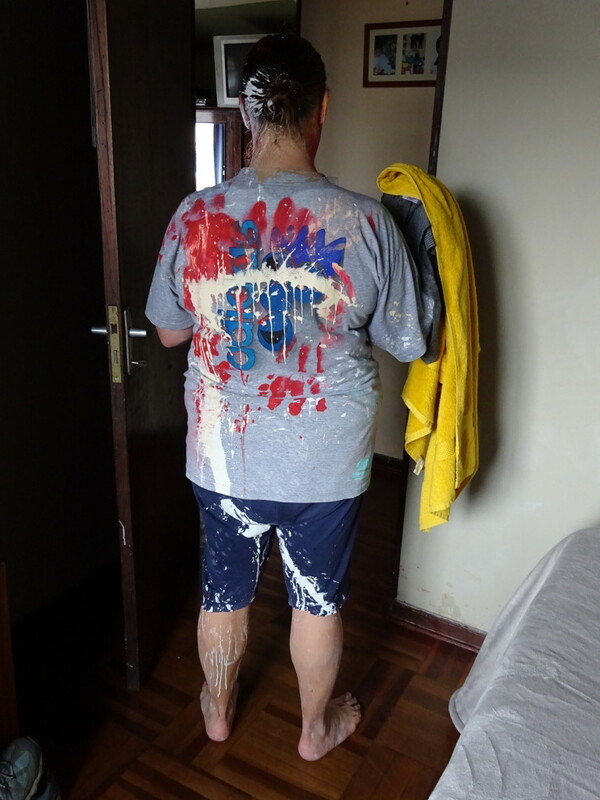 A few men in their 30’s (just guessing) came up to us in our clean clothes and transcended the language barrier when they dipped their hands in their paint buckets and gave us the internationally understood, “okay?” look as they gestured towards us with paint dripping. 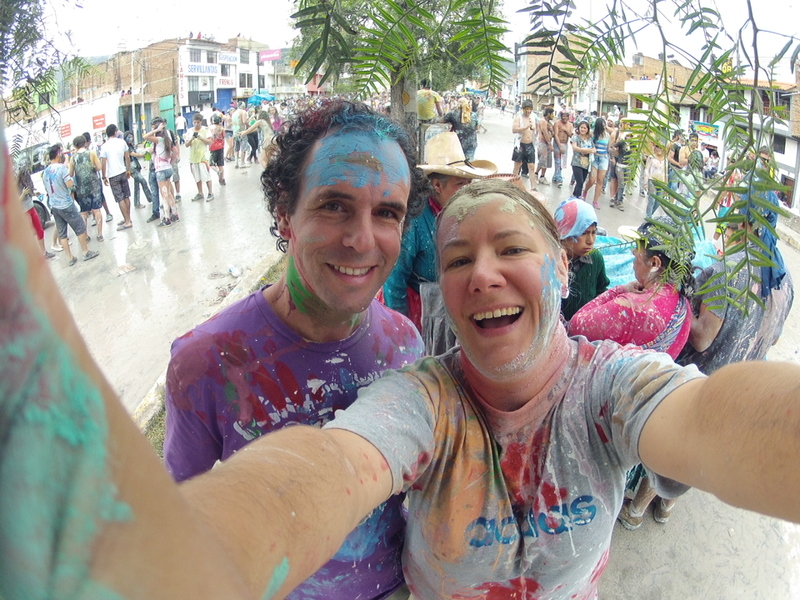 We nodded and just like that, they ever so respectfully initiated us into Carnaval with a few good swipes of paint. Then they handed us their buckets so we could dip our hands and take a few swipes ourselves. And with that we were off! 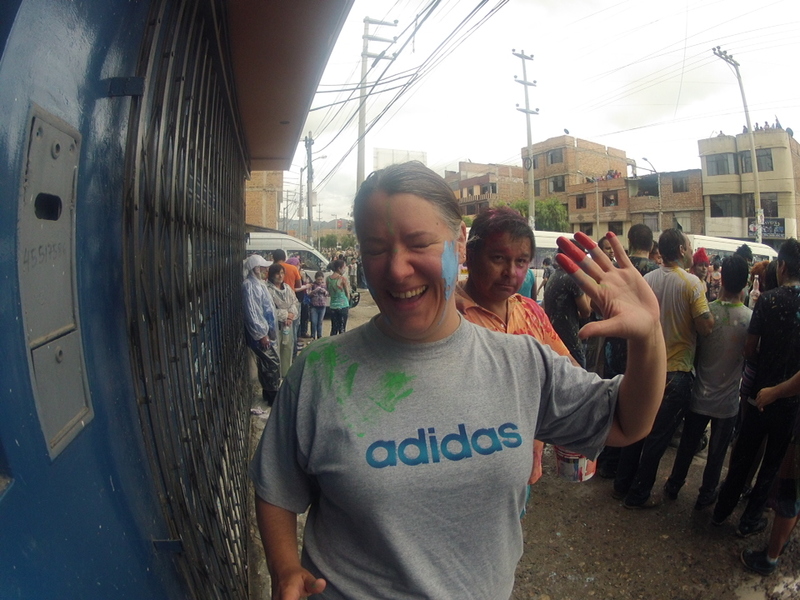 We kept getting splattered with paint, hit with water guns, dumped upon with water and constantly smiled at for being “the older gringos willing to get dirty!” It was great! We walked until we got to the end of the throngs of people and found the line of policia marking the moving end of things and then we joined right in marching along in front of them. I really wanted a picture of the cops in painted uniforms, but the travel doctor at UW had warned, “In Peru don’t take photos of anything military!” Aaron reminded me of that fact as I reached for the camera and then put it away again. Remember what I said: Rule Followers. We danced a little – and if our dance teacher Lynn is reading this, yes, we used our latin motion to the delight of the crowds. And we were in at least two seperate home videos that locals were making. 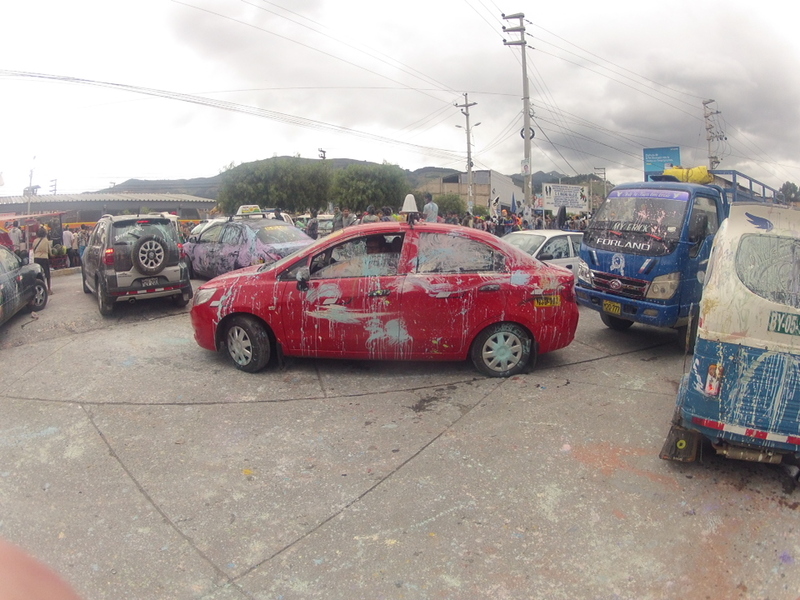 Not too many gringos here in Cajamarca, so I think it was a treat for them to see! 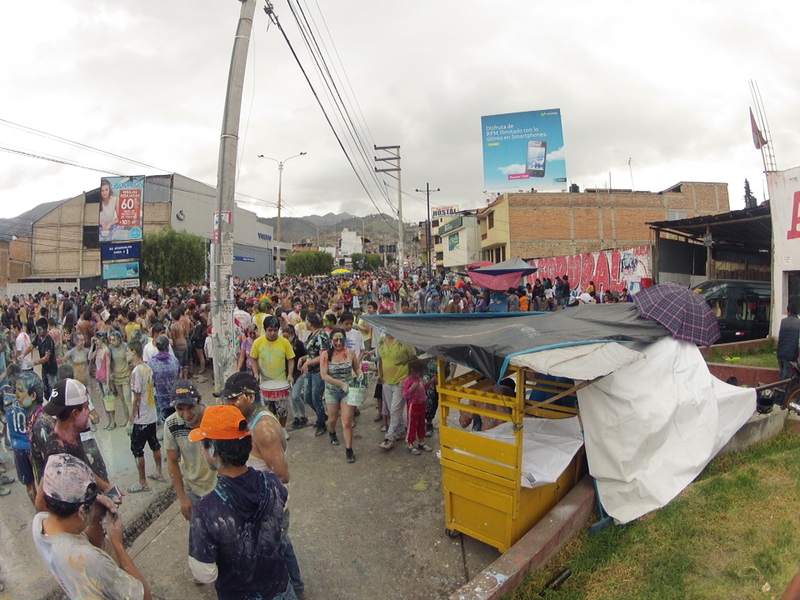 We had a blast and as we broke off to march our way home with a smaller and smaller band around us, Aaron and I agreed that Carnaval here in Cajamarca, unlike St. Patty’s Day or Mardi Gras back home, has a much more wholesome, family-friendly feel to it. Yes, there was some boozing to be sure, but it’s much more about the paint than the liquor. One classy touch was that people keep their clothes on…though the number of men peeing in public was exceptionally high. Hey! Who wants to get painted??? Around dinner time the painting cease fire will take hold for another year. The Carnaval events will turn to dances and parades. They will crown kings and queens, do traditional dances, and have multiple parades. We will do our best to catch at least a glimpse of these events and report back! Until then, happy Carnaval! Painted Pups! Days later we still saw dogs with fur of all colors. It was also Valentine’s Day, so we’ve got to show you some of the love birds. With that, we head to the showers. Happy to hear that you could put your dance education to use! No doubt it won’t be the only time in your travels. “we’re nothing if not rule followers”. Oh sure! Nice young couple staying home, both working, scared of adventure and only travel on carefully arranged tours. Not! Wellll, we do follow at least SOME rules. Typically anything involving the military or police… You’ve got a point, though. Guess we didn’t do the 2.6 kids either. Some rules are indeed made to be broken.